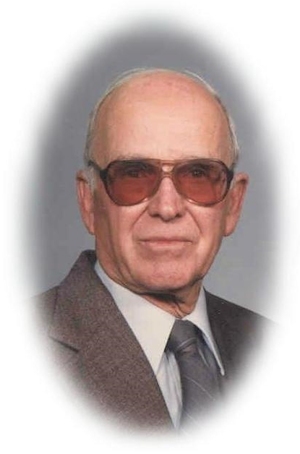 Obituary – Cockrum, Lorren Tontz « Perry High School Alumni Association, Inc.
Lorren Tontz Cockrum, 88, of Perry, Oklahoma was the son of Charles Franklin and Mary (Tontz) Cockrum. He was born December 12, 1914 in Perry, Oklahoma and died Thursday, December 4, 2003 at Stillwater Medical Center.Funeral services will be at 2:00 p.m. Saturday, December 6, 2003 at Christ Lutheran Church. Rev. William Metz will officiate. Interment will be in McGuire Cemetery at Lucien under direction of Brown-Dugger Funeral Home. Memorials may be made to the American Cancer Society in care of Brown-Dugger Funeral Home. He was a graduate of Perry High School. On July 7, 1940, he and the former Lorene A. Grother were married at Cushing, Oklahoma. Lorren was owner-operator of Cockrums Furniture in Perry. His hobbies included fishing and hunting. He especially enjoyed quail and goose hunting. Lorren also enjoyed automobiles and mechanicing.He was a member of the Perry Chamber of Commerce and the Better Business Bureau. In addition to his wife, Lorene, survivors are one son, Forrest Cockrum, of Grand Lake, Oklahoma; one daughter, Karren Sue Lyons, of Perry, Oklahoma; five grandchildren, six great-grandchildren, four brothers, Alvin Cockrum, of Perry, Oklahoma, Milt Cockrum, of Georgetown, Texas, George Cockrum, of Midwest City, Oklahoma, and J. E. Cockrum, of Valley Center, Kansas; three sisters, Lenora Price, of Ponca City, Oklahoma, Marietta Moran, of Tulsa, Oklahoma, and Gracie McKee, of Lucien, Oklahoma. His parents, Charlie and Mary Cockrum, one son, Stanley Cockrum, two brothers, Gilbert Cockrum and Barren Cockrum, and two sisters, Berniece Rice and Maxine Pryor, preceded him in death.